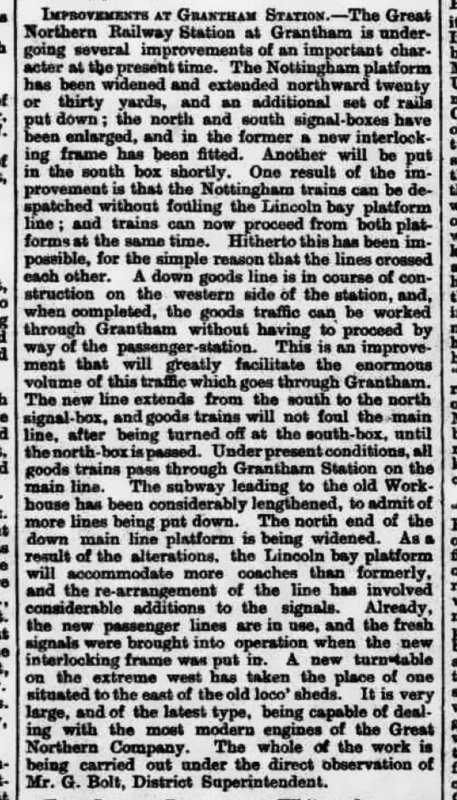 Grantham North was one of three signal boxes opened at Grantham in 1874 and 1875. They ensured that signalling at Grantham station’s expanding and increasingly busy layout complied with government legislation and regulation relating to railway safety, in particular the interlocking of points and signals. also on the Down side the locomotive shed - then of modest size but expanding to meet the needs of growing traffic on the main line and the branches. In its first configuration the box had 35 levers. It worked the Main lines north to Grantham Junction box, at the convergence of the line from Nottingham about ¾ mile north of the station, and south to Grantham Yard box situated at the south end of the passenger station. In 1881 the GNR relocated the junction of the Main lines with the Nottingham lines from Grantham Junction to the north end of the station. This involved extending the Nottingham lines parallel with the Main lines from the former Grantham Junction to south of Harlaxton Road, widening the embankment and bridges from two tracks to four. On 24th April 1881 a new signal box at Grantham North was opened with 70 levers, of which 17 were spare in anticipation of further expansion. 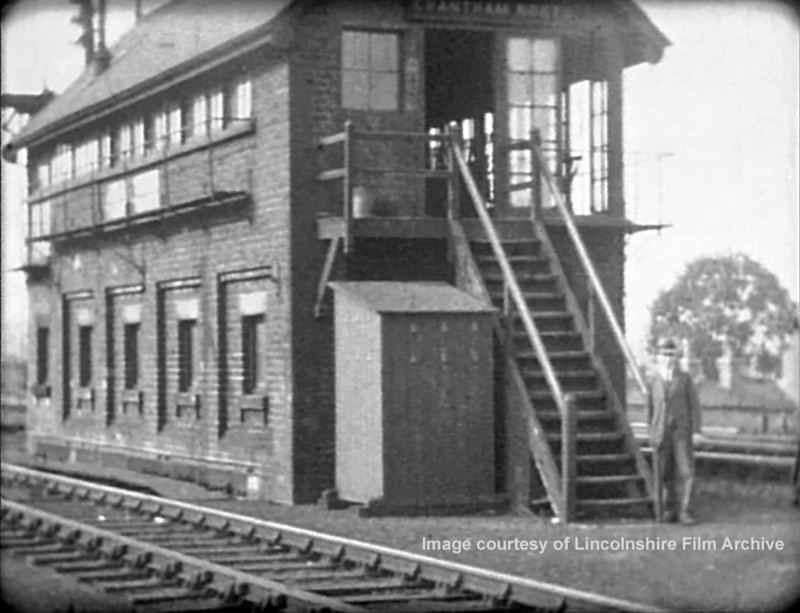 The Main lines and the Nottingham lines were worked independently from their junction at Grantham North as far as another new signal box, Barrowby Road, which was built near the site of the former Grantham Junction. When Grantham locomotive shed was enlarged in 1897 with the construction of the ‘Top Shed’, the coal stage and other improved facilities all the spare capacity at the North box had been taken up so, in 1898, additional levers were added to the frame at Grantham North bringing the total to 73. This marvellous panorama of the north end of Grantham station was taken on 17th June 1902. It records the arrangement of the track and signalling before improvements of 1903 changed much of the layout on the right, as will be explained in the next section. The nearest signal is Grantham North's starting signal for the Lincoln bay platform, under the canopy. It has a somersault arm with its lamp and spectacle mounted several feet below, as was conventional on the GNR until about the turn of the century. Its post, however, remains from the much earlier period of slotted post signalling, as can be seen from the slight increase in width just above the point where the lamp and spectacle are fitted. The starting signal for the Nottingham platform is on the platform itself - its post can be seen to the left of the second canopy support column. Its arm also originally worked in a slot in the post, as is clearly evident in this photograph. Right at the centre of the picture there's a glimpse, above the station footbridge, of the co-acting Up Main line starting signal arms at the Yard Box, demonstrating their visibility to approaching drivers from a distance. Photograph taken by Rev. T.B. Parley. In 1903 the GNR installed a new Down Goods line around the western side of the station so that northbound goods traffic could be routed clear of the station to give passenger trains priority. The Down Goods line left the Main line at Grantham South box and it connected with both the Down Main line and the Nottingham line at Grantham North. This required yet more capacity at Grantham North. A new interlocking lever frame of 105 levers was installed, accommodated by extending the building northward. The Down Goods line was worked to Grantham South box. These and other improvements are described in the following article from The Grantham Journal. 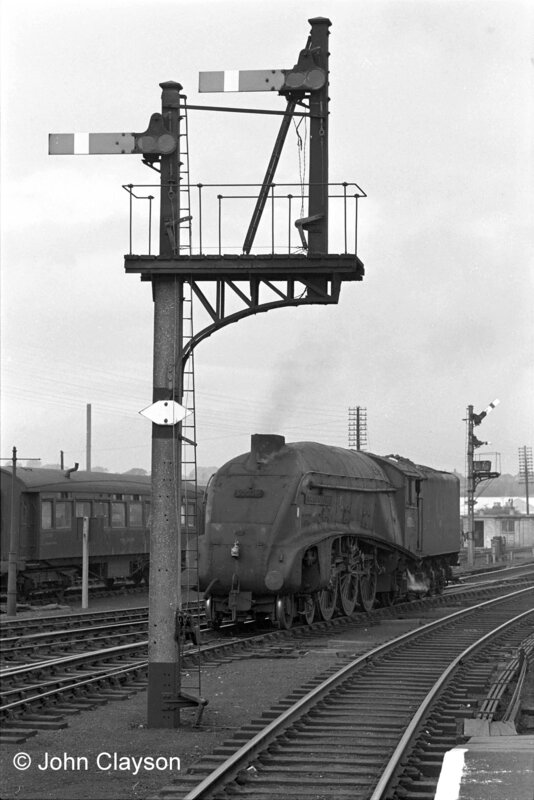 The introduction of the Silver Jubilee streamlined high speed passenger service in 1935 demonstrated the limitations of Victorian mechanical signalling on some sections of the East Coast Main Line, including in the Grantham area. To pave the way for further high speed services in 1937 a combination of electric track circuiting with some automatic and controlled colour light signals allowed Grantham North to assume control of the Main lines for the 4 miles north to Barkston South Junction. The modernisation involved the installation of electro-mechanical relays, the electrical equivalent of the interlocking lever frame. A single storey brick relay room was constructed immediately south of the box to house this equipment. The box steps were moved to the end of the new building and thereafter the box was entered by walking across the flat roof of the relay room. The new signalling arrangements between Grantham North and Barkston South Junction came into effect on 17th October 1937. From that date Peascliffe signal box closed and Barrowby Road box was no longer involved with the signalling of the Main lines. On 10th May 1943 the Goods line was made bi-directional and became known as the Up & Down Goods line. This meant that freight traffic for the south from the Nottingham line could avoid using the Main line through the station platforms. It was the last significant augmentation of facilities at Grantham North in the era of ‘traditional’ railway signalling. In the 1950s the use of diesel multiple units (known by Grantham railway staff as railcars) on local trains, along with reductions in local services (for example, the withdrawal of the passenger service to Leicester Belgrave Road), reduced the number of movements to and from the locomotive shed. From the late 1950s, with the introduction of diesel electric locomotives on main line services, the intensive routine of locomotive changes rapidly tailed off, having been a tradition at Grantham since the 1860s. 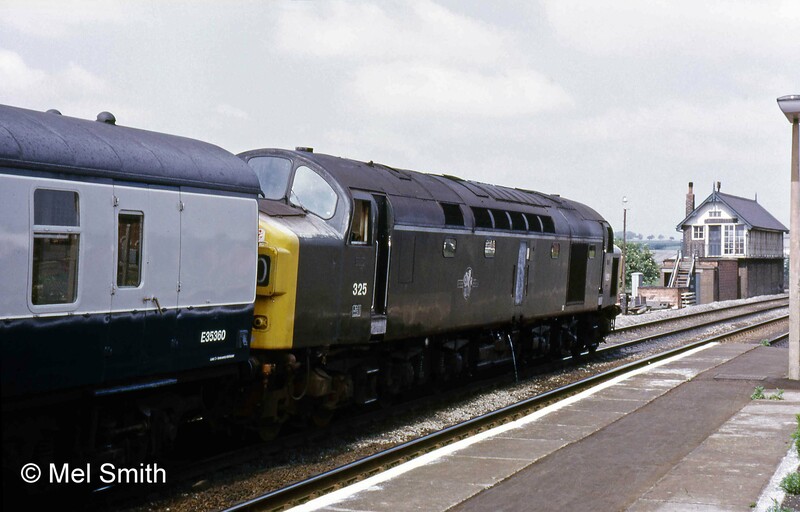 ♦ The rundown of passenger and freight rail services across Britain from the mid-1960s led to rationalisation of track and signalling around Grantham. At the same time, power signalling technology enabled the remote control of points and signals over a wide area from electronic switch control panels. The writing was on the wall for traditional mechanical signal boxes, especially those on intensively operated high speed main lines. 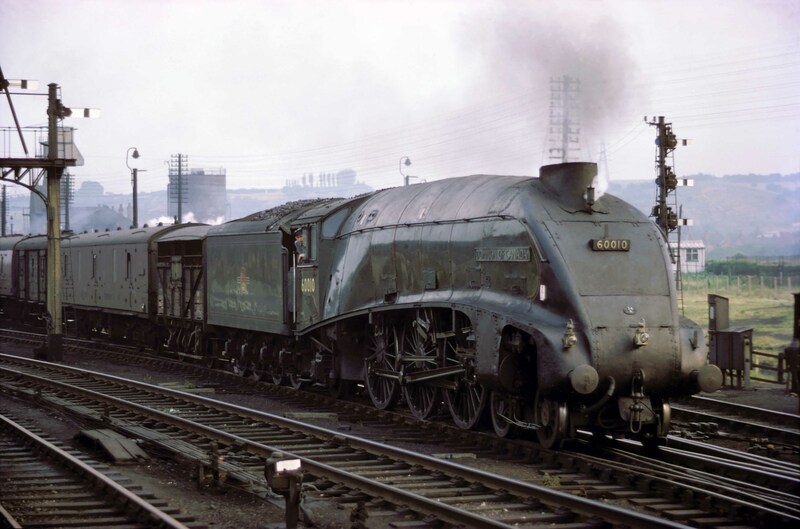 ♦ With the advent of High Speed Trains (HSTs), there was a desire to remove the junction for Nottingham from the curve north of the station so that superelevation of the curve could be increased to take full advantage of the new trains’ capacity to reduce journey times. 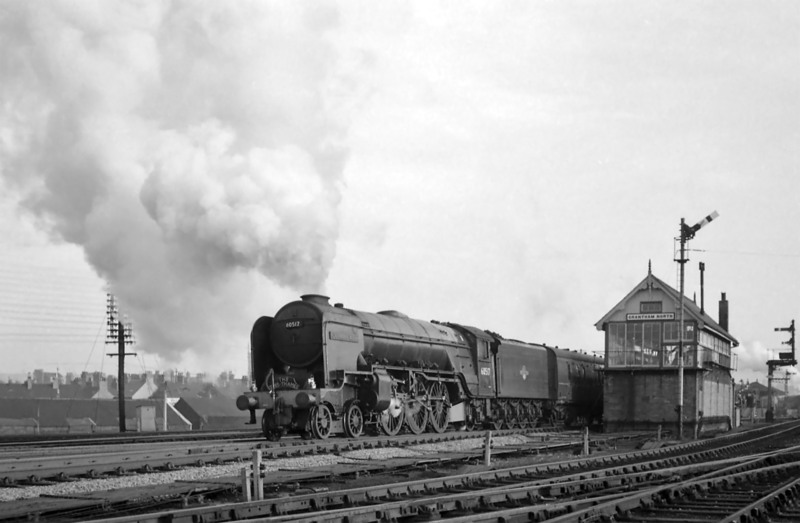 ♦ In September 1963 Grantham locomotive shed closed. In March 1964 associated track and signalling was taken out of operation, including that specifically provided to facilitate locomotive changes. ♦ A second and more radical phase of rationalisation and modernisation began at Grantham North. Carried out in stages between and April and June, opportunity was taken to prepare for the Main lines to be reconfigured for higher speeds by the removal of most connections on the curve north of the station. This included closing the Up Bay platform (the former platform 1) and removing the junction with the Nottingham lines. In future, access to the Nottingham line from the Main line would be at Grantham South. 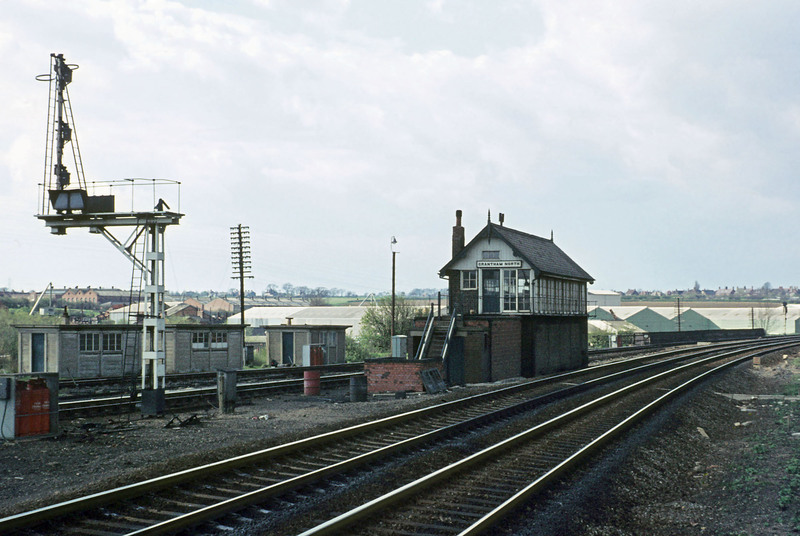 ♦ On 4th August 1968, on the Nottingham line, Barrowby Road signal box closed, along with the next signal box to the west, Gonerby; control of the Nottingham lines from Grantham North box extended to Allington Junction. ♦ In February 1970 the Nottingham line was singled from Grantham North to the site of the former Barrowby Road box. The Up line was taken out of use, the former Down Nottingham line becoming the Up & Down Nottingham line. ♦ In April 1970 a new link 500m long opened between the Up & Down Nottingham line at Barrowby Road and the Down Main line near the bridge over Gonerby Road. It allowed the closure of the connection from the west side of the station into the Down Main line, which passed between the ends of the platforms and Grantham North box. That was the last connection into the Main lines to be operated mechanically from Grantham North. 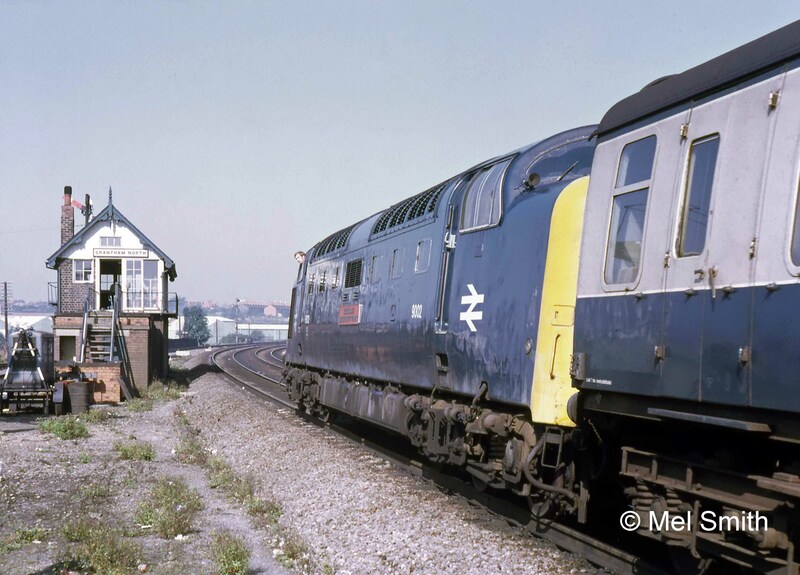 ♦ In June 1971 Grantham Yard box closed, to be adapted for the installation of an electronic switch control panel which would take over the signalling of the entire Grantham area. 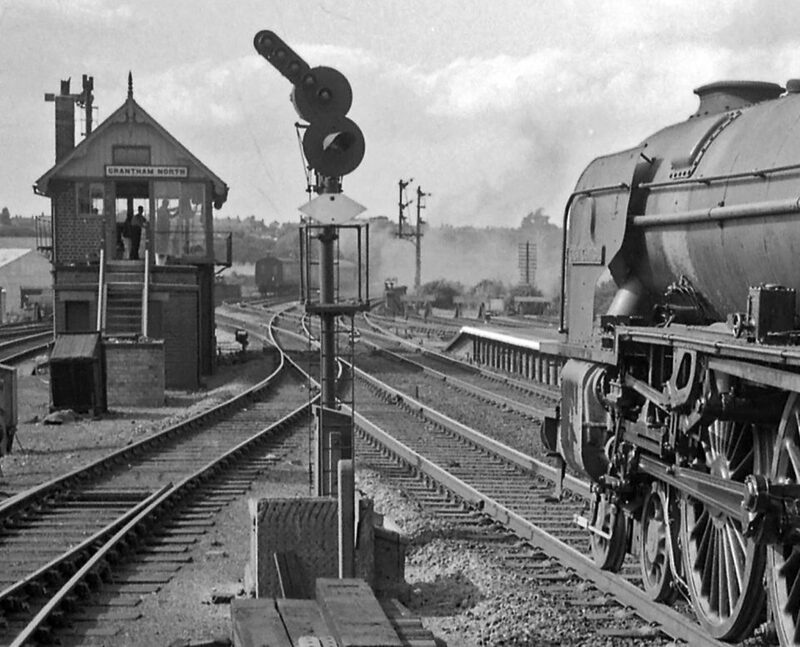 For eight months Grantham North and Grantham South boxes worked the area between them while the remaining mechanically operated points were prepared for remote power operation and colour light signals were installed to supersede the last semaphore arms. 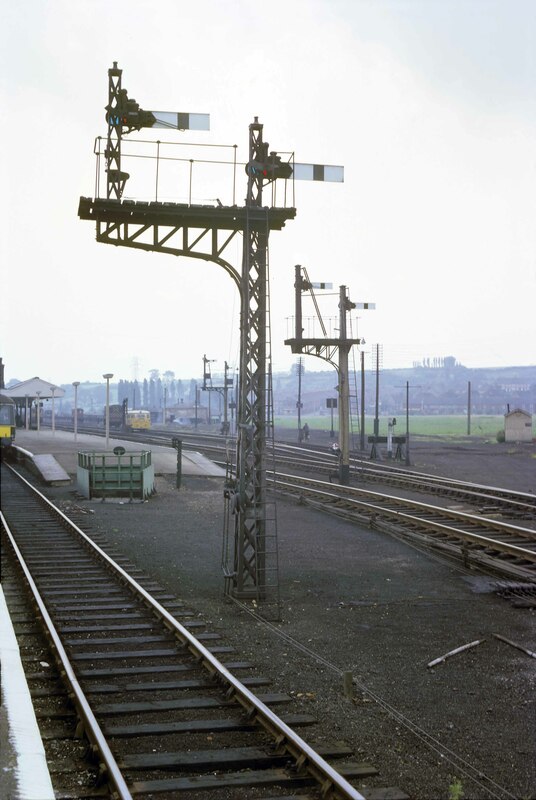 ♦ On 20th February 1972 the panel at the new Grantham panel signal box came into service and Grantham North box closed, along with Grantham South. 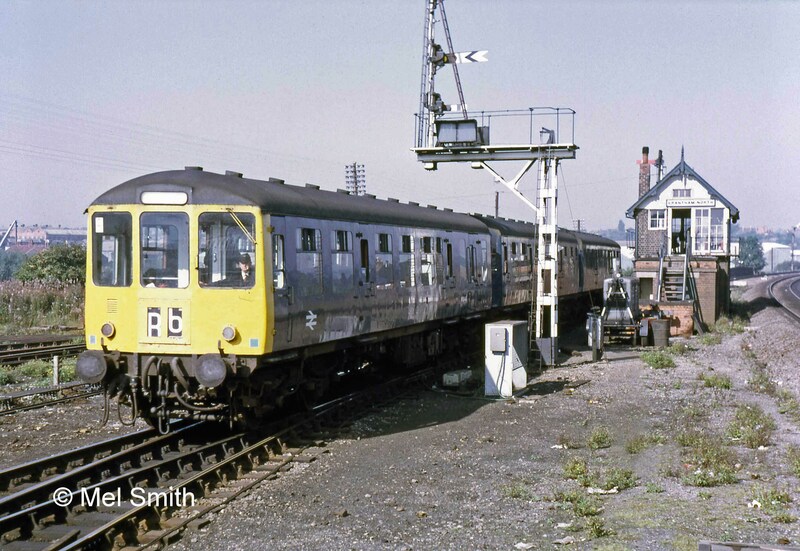 Since May 1980 signalling at Grantham has been controlled from Doncaster Power Signal Box. Although physical arrangement of lines, junctions and connections has changed much since the days of mechanical signalling at Grantham North, the old Up Main and Down Main lines, the Nottingham line and the Up & Down Goods line all remain, though renamed to reflect modern operating arrangements. The Down Bay and Western platforms are as busy as ever too, used by trains serving a wide range of destinations. The following series of photographs illustrates some of the developments at Grantham North signal box described above. Here is Grantham North viewed from the south west on a summer’s evening in 1937, most likely 5th July. The nearest four windows in the base, with their recessed brickwork, show its length as built in 1881. The far window, without the recessed panel, is the extension of 1903 which differs also by having a full height window at operating floor level. Later in 1937 a relay room was built adjacent to the south end here. The steps were repositioned to give access to the operating floor of the box across its roof. The box and its relay room are seen just above centre in this view taken on 19th April 1950. 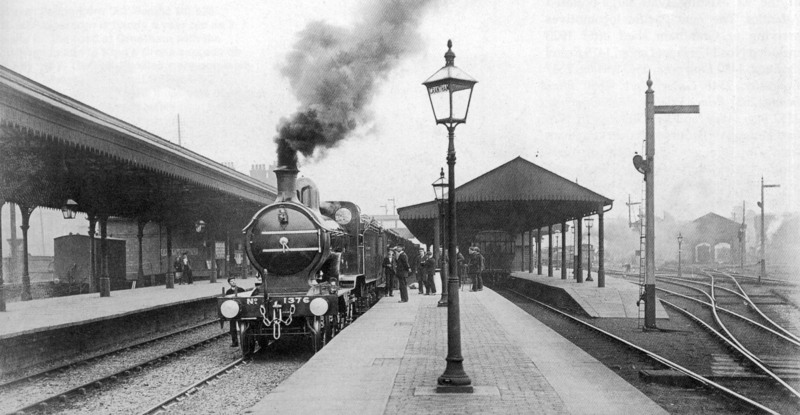 A locomotive steams past approaching the north end of the station, probably heading for the Yard Box engine siding to wait for a southbound train which it is due to take forward. 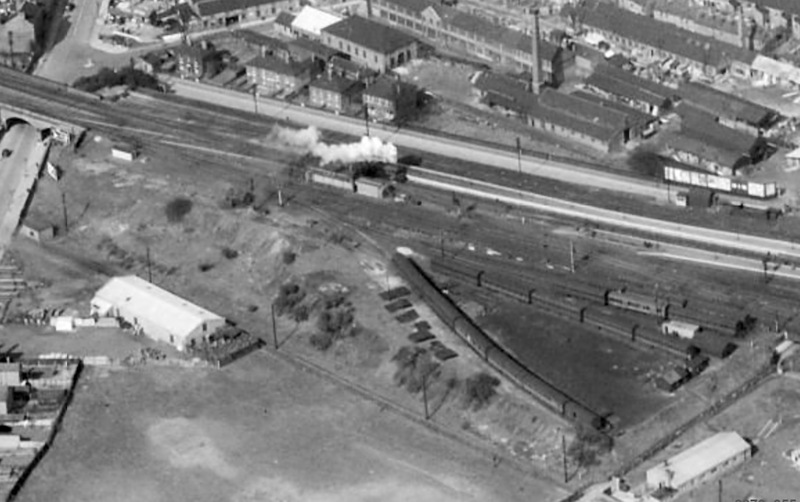 The sidings at lower right, being used to store old coaches, are part of the Civil Engineer’s yard. In this picture of the late 1950s or early 1960s we can see how the windows in the base of the box have been bricked up. This was a wartime measure intended to give some protection from air raid damage to signal boxes which had vital strategic importance. No. 60517 Ocean Swell gets away northbound on the Main line, while a train for Nottingham is signalled past the western side of the box. A Down (northbound) fully fitted express freight train which has paused on the Up & Down Goods line sets off once more on its journey. ‘Fully fitted’ means that every vehicle on this train was equipped, or ‘fitted’, with the automatic vacuum brake, which was controlled by the driver and could be applied by the guard. Such trains were permitted to travel at faster speeds than ordinary freight trains, which might have brakes only on the locomotive and the guard’s brake van. The type of train was indicated by the number and position of the front headlamps. In this case there are two: one in the central position above the coupling hook and another over the right buffer. Class ‘A4’ locomotive No.60010 Dominion of Canada. The shed outlet signal is on the right. Photograph taken on 12th July 1962 by Cedric A. Clayson, © John Clayson. The first stage of track and signalling rationalisation at Grantham North has taken place with the removal of the locomotive yard and all facilities specifically associated with locomotive changes. For example, gone is the engine spur which used to be to the right of the familiar Down Bay starting signal in the foreground, though the wooden post with its lamp to mark the position of the buffer stop for drivers remains in place. The Western platform and the Goods line signals also remain as they were. Just off the platform end the ventilation shaft for the pedestrian tunnel from Station Road to Huntingtower Road can be seen. This was the route used by Loco staff who lived on the east side of the line to gain access to their place of work in the Loco. Photograph taken in September 1965 by Cedric A. Clayson, © John Clayson. The removal of the Main line connections in the vicinity of Grantham North together with the shortening of the Up platform at its northern end enabled the Permanent Way Engineer to realign the curve for higher speeds. No.9002 The King's Own Yorkshire Light Infantry leans heavily on the inside rail as its driver awaits the guard’s ‘right away’ signal in October 1971. Another train is signalled to leave northbound on the Nottingham line. 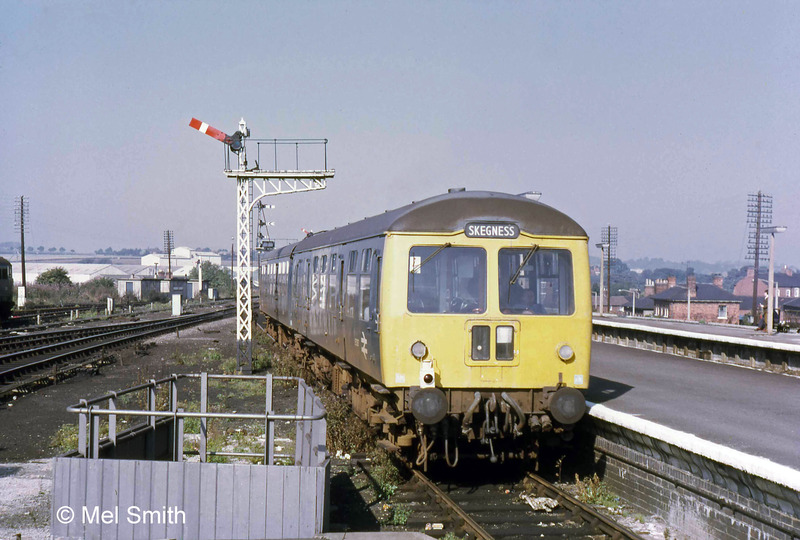 On the same day in October 1971 a local train arrives from the Nottingham line and approaches the Western platform. The signal post at this point is at the same site as one seen previously but it is a new structure, provided to allow a distant signal arm to be added. Until April 1970, when a new link was provided at Barrowby Road, there was a connection into the Down Main line here in the area between the photographer and the signal box. Leaving the Down Bay platform for Skegness in October 1971 this train would, in former days, have taken the connection to the Down Main line at this point. As can be seen, with the removal of the Main line signal post which had been fixed on the overhanging end of the bracket, this is no longer possible. The new connection at Barrowby Road will enable this train to reach Barkston South Junction, where it will turn off the Main line. In 2005 a connection opened at Allington, a few miles out of Grantham on the Nottingham line. Thereafter trains between Grantham and East Lincolnshire no longer used the Main line, and Barkston ceased to be a junction. Seen on 15th April 1972, Grantham North box has been closed since 20th February. Its role was absorbed into the new Grantham panel signal box situated in the former Grantham Yard box building. Photograph from The Charles Weightman and Alan Bullimore Collection. A slightly later view with the box nameboard removed. I purchased the Grantham North and South Box name boards and track circuit diagrams from the Eastern Region - £1.50 each for the nameboards and £1 00 each for the diagrams. I had to saw a lump out of my Triumph Herald in the station yard to get the north diagram in, which was stupid heavy! I still have the Grantham North name board which is the one that was situated on the south end of the box (my brother had the other and sold it on). I also have the only original South Box board (the other was a temporary replacement for some reason) off the north end of the box and both t/c diagrams. They reside in Arnold and I'm proud to have saved them. It's really good to hear that these evocative pieces of Grantham's railway heritage have been preserved and are being cared for. What trouble you went to to collect them. From personal experience I know that it's very easy to underestimate the dimensions of railway infrastructure. Until now Mel's photograph at the end of the page, which shows the box closed and stripped of its nameboard, has always struck a plaintive chord with me. However in future we can look at the picture knowing that the board was in safe hands, saved from what was most likely to have been its ultimate fate - a lineside bonfire. Signal box nameboards are, in my opinion, of at least equal significance to the heritage of the railway as locomotive nameplates, train headboards etc., yet so often they were just burned when boxes were demolished ...though I suppose that if they had been better appreciated the boards from two of the most significant ECML boxes would not have been obtainable for 30 bob!